On the occasion the 26th anniversary of the demolition of Babri Masjid, opposition CPI(M) in Tripura took out a protest rally in Agartala and asked the BJP-led Central Government and the RSS to protect the Indian Constitution and its secular fabric. On this day in 1992, the 16th century Babri Mosque at Ayodhya in Uttar Pradesh was demolished by a large number of ‘kar sevaks’. 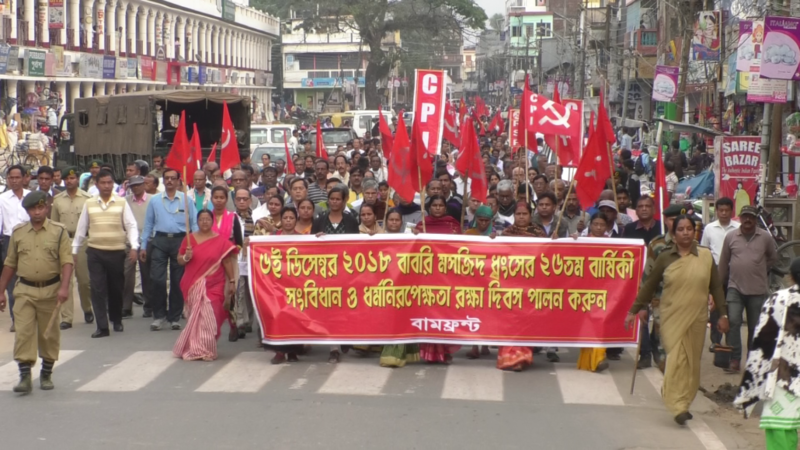 Hundreds of CPI(M) party activists took part in the procession that started from the Paradise Chowmhuni area and went through the streets of the capital city. They raised anti-BJP and anti-RSS slogans and alleged that both BJP and RSS have polarised the people of India using religion card for political gains. He added that the BJP & RSS spread the “message of hatred for polarizing the people for political mileage”. Sarkar viewed that this rally is to bring closer the people from various religions especially the Hindus and the Muslims and get them united they saw the ugliest day in India’s post-independence on this day, 26 years ago. Around 1.5 lakh ‘kar sevaks’ pulled down the domes of Babri Masjid claiming that it was a temple and the birthplace of Hindu God Rama and a temple should be constructed there.